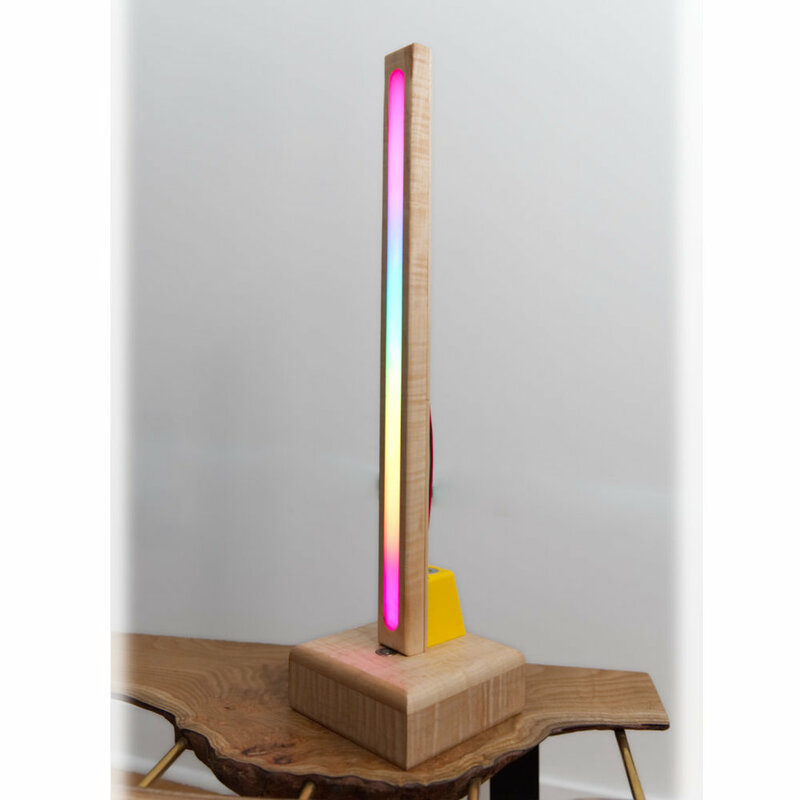 I made a wireless 3-in-1 RAINBOW RESIN lamp -- TRANSFORMS from Sconce -> Table Lamp -> Task Light using Magnets and Magic!! This video shows how to make a wireless DIY rainbow epoxy resin LED lamp that transforms between a sconce, table lamp, and task light. This is a simple DIY woodworking and epoxy resin project. I used a layer of white epoxy resin covered by a layer of clear epoxy resin to diffuse the LED strips. The lamp is made of three pieces that connect with a clever system of magnets and steel washers, that allow you to transform the lamp from a vertical sconce, to a horizontal scone, to a desk lamp or table lamp, to a task light. And since the lamp is battery-powered and rechargeable, it is easy to use in many situations. (The batteries last about 3 hours under normal use.) To top it off, the LED controller I used has a Bluetooth app, that allows the LEDs to be controlled via a Bluetooth connection to your phone. The lamp base and light bar are made from hardwood maple, and involve fairly simple woodworking skills. The support block was 3D modeled in Fusion 360 and 3D printed using my Anycubic 3D printer. The LED strips I used were SK6812 RGBWW LEDs. 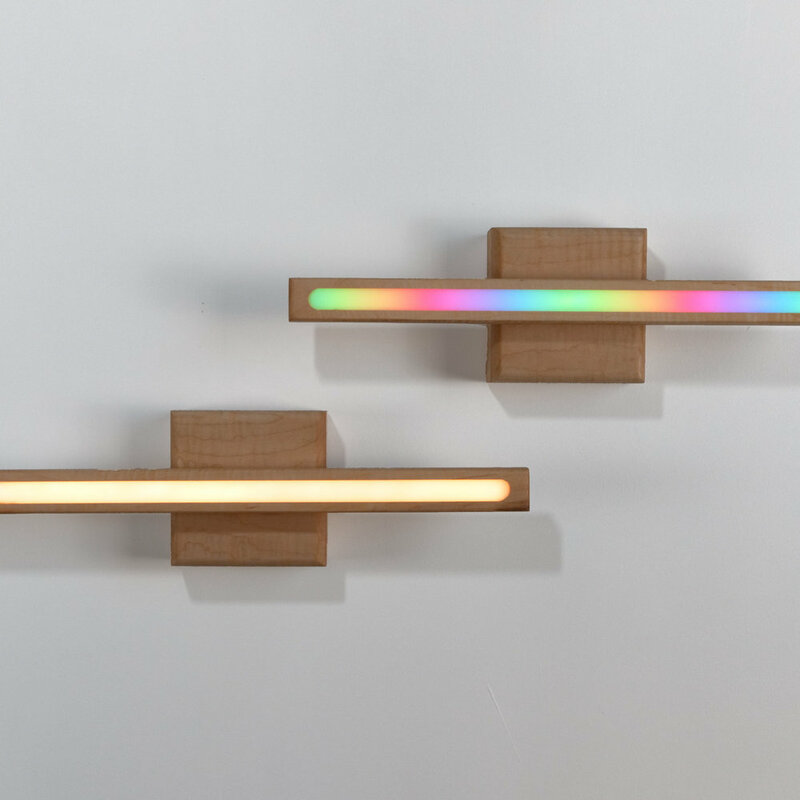 These LED strips are individually controllable neopixels that have RGB LEDs and separate warm white LEDs, so the lamp can do colorful displays and operate in a music syncing mode, or serve as a more refined and sophisticated warm white light source. 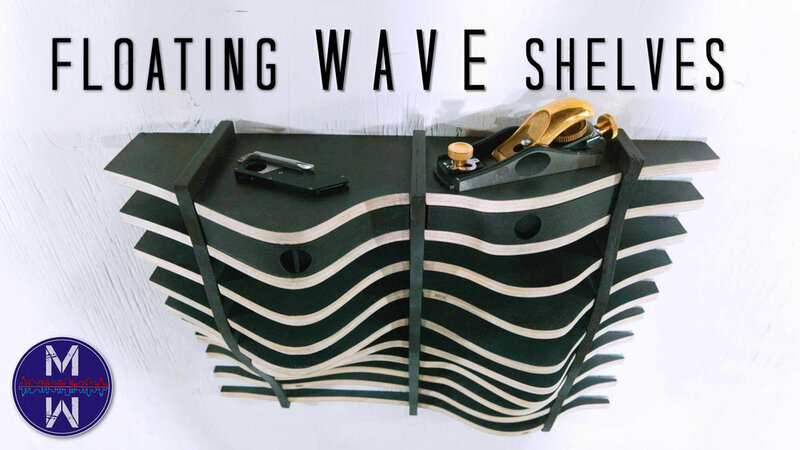 The video shows not only how to make a modern floating wave shelf, but also how to use parametric design in Fusion 360 to create all kinds of cool parametric furniture and designs. Specifically, I used the Slicer plug-in for Fusion 360,allows you to take 3D models and slice them into 2D shapes that snap together. The software also will automatically create 2D templates of the pieces, so that you can cut them out with a jigsaw or bandsaw, making this a simple woodworking project. Or you can cut it out of the 1/2" plywood on your X-Carve CNC using the Easel project I created (link below). In this video, I show how to make a DIY wireless-charging battery-powered epoxy resin LED cube lamp. Since this DIY LED cube light is battery powered and wirelessly charged it is totally portable and has a ton of uses -- a mood light, a party light, a night light, etc. The video also shows how to make the custom wireless charging pad for the epoxy LED cube, which an easy woodworking project. This LED cube light is battery-powered by a LiPO. I used Total Boat 2:1 epoxy resin to make the cube, doing small 1/2" epoxy pours to build up the epoxy in the melamine form. All the electronics are off the shelf parts from Amazon, including the music reactive sp106e LED controller. MODUSTRIAL MAKER SHIRTS – MUCH LOVE FOR YOUR SUPPORT! This video shows how to make a modern DIY LED table lamp or desk lamp from concrete, a 2x4, epoxy resin, and a water pipe. This is a fairly simple DIY woodworking and concrete project with a modern look. In this tutorial video, I show how to make a modern DIY LED table lamp or desk lamp from concrete, a 2x4, epoxy resin, and a water pipe. This is a fairly simple DIY woodworking and concrete project with a modern look. To make this modern LED light I cut a channel in a 2x4, and put a PEX tube in it, then poured epoxy over the tube. This created a hollow channel where I could insert an LED strip. The tube and epoxy act as a diffuser for the LED lighting. How to Make a EPOXY LED pendant light - new DIY video up now!! This time I show how to make a DIY Epoxy LED pendant light. In this renovation video, I show how to make a DIY modern platform bed with surround cabinets, LED lighting, and a live edge slab headboard. In this renovation video, I show how to make a DIY modern platform bed with surround cabinets, LED lighting, and a live edge slab headboard. The platform bed and cabinets are made from 10 sheets of maple plywood, and I added a live edge slab headboard. I used LED strips and acrylic diffusers to create overhead reading lights that are controlled by touch panel on the side of the bed. 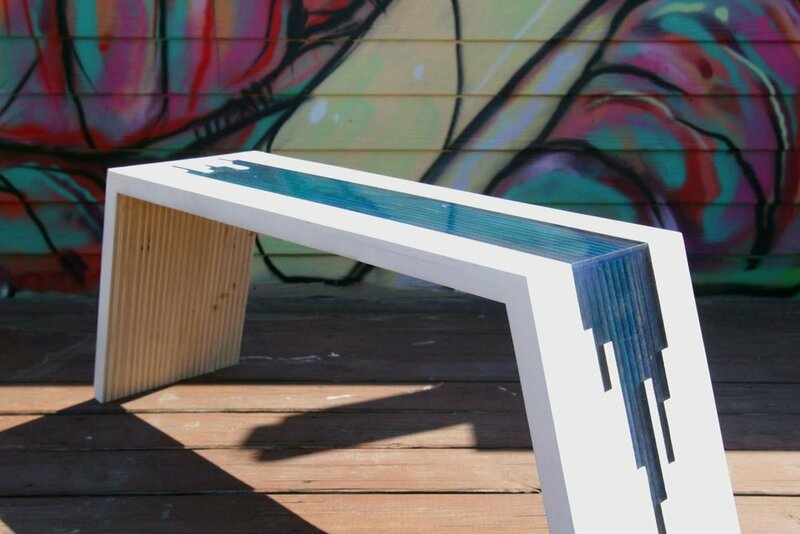 This tutorial explains how to make a modern DIY bench with blue concrete legs and a plywood top. n this video, I explain in detail on how to create a DIY faux marble top from concrete. The video also explains how to mix GFRC concrete, than I've provided in past videos. (GFRC = glass fiber reinforced concrete.) The first half is intended to be more of a tutorial than my past videos. You can use the concrete marbling technique shown to make coffee tables, dining tables, "marble" concrete countertops, and so on. However, in this video I also wanted to show a smaller project you can make with concrete. The second half of this video shows how I made two DIY 'marble' serving trays. The serving trays use the marble concrete slabs as tops, and simple wooden frames with handles cut out of them. The frames can be made a number of ways using simple woodworking techniques. Making an Impossibly Thin Curved Concrete Bench -- Find out How! Find out about the special type of concrete that allows for this insanely thin bench to be made, and whether the bench actually can hold two adult males….. This Ikea hack video shows to make your own drawer fronts for the Ikea Nordli dresser. The Nordli dresser is very low-profile, and also makes a great media center – I’m actually going to be using my Nordli hack as a combination dresser / media center in my bedroom. This is a DIY woodworking project that can be as easy or as difficult as you want it to be, and use everything from high-tech CNC machines to hand tools. The only limit is your imagination. This episode shows how to make a modern industrial LED floor lamp from a reclaimed timber beam and steel, with NO WELDING! I'm excited to announce that I've signed on to start working with Inventables -- the company that makes the X-Carve CNC. I don't own an X-Carve, so I will be using one at my local maker space. 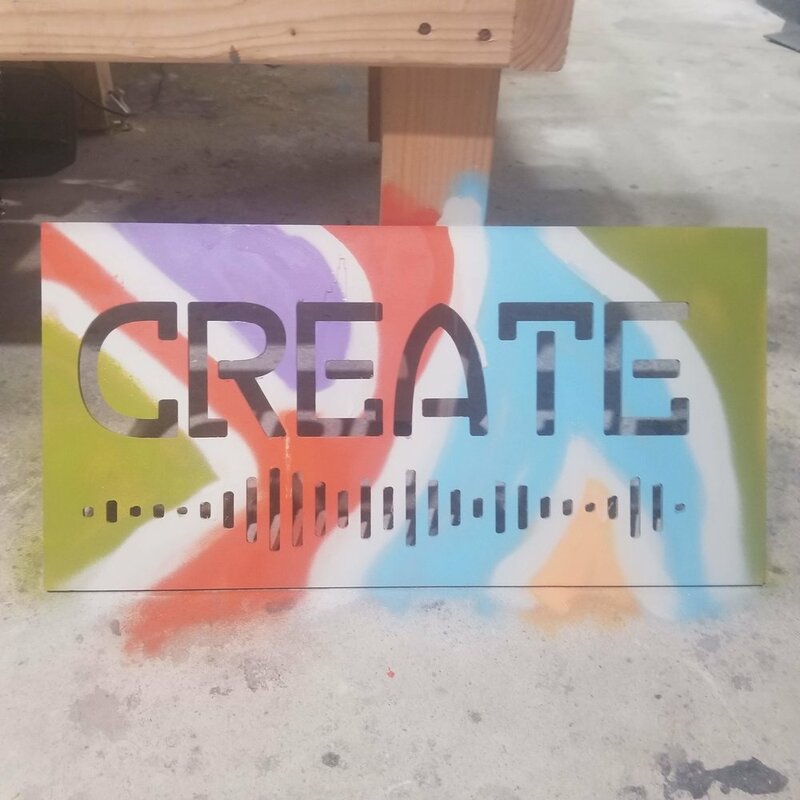 Last week, I headed over to the space and carved my first project -- this "create" sign for the shop. To make it, I created SVG files in Affinity Designer, and imported the SVGs into Easel. It was incredibly easy. I highly recommend giving Easel a try -- just play with it and see what designs you come up with. I have a hunch after you do, you'll quickly be looking up your local maker space to figure out how to turn those designs into reality! I also put together a quick video showing the carving process. This video won't be posted on my YouTube channel, so check it out here! This video shows how to make a DIY Plywood and Epoxy Resin River Bench. 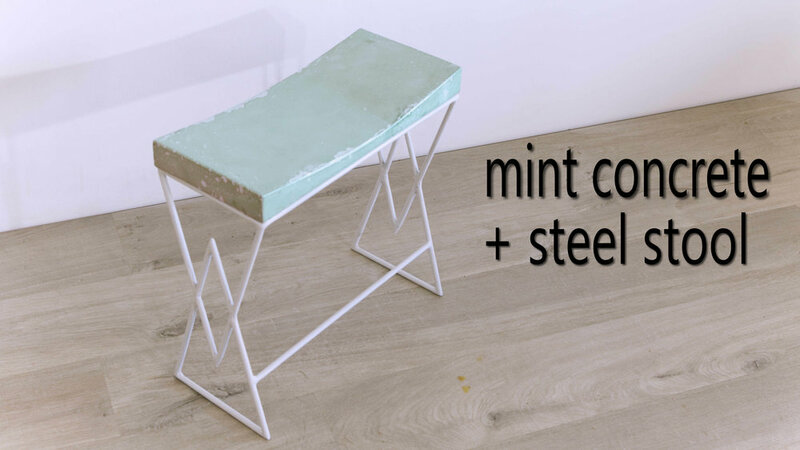 In this video, I show how to make a DIY mint green concrete stool with a welded steel base. Yes, the concrete is mint colored :) I also made a white concrete stool to go with it. The mint concrete color was achieved by using a combination of green and white powdered pigments in Fishstone's glass fiber reinforced concrete (GFRC) concrete mix. In this video, I show how to make a DIY Waterfall Concrete Coffee Table with a Live-Edge Slab Inlay. I used a white glass fiber reinforced concrete (GFRC) mix to get the gleaming white concrete. The live edge slab is Cuban mahogany and the legs are made from African mahogany. Step-by-Step Tutorial to make a Bluetooth Boombox from Recycled Skateboards -- Available Now! I just uploaded a full step-by-step tutorial to Instructables explaining how to make my ported Bluetooth boombox from recycled skateboards. While the tutorial explains the process using the reclaimed skateboard wood, it can be easily adapted to use any kind of wood you have available. In this video, I show how to make a portable bluetooth boombox from twice recycled skateboard wood. I managed to use every part of the skateboard in this DIY speaker build. The front panel is formed from reclaimed skateboard wood, the handle of the speaker is made from skateboard trucks, and the feet are made from skateboard wheels and bearings. I used Dayton Audio kit parts for the electronics. It has a 2x50w Bluetooth amp, which is driving two Tang Band 5” W5-2143 full range speaker drivers. It is battery powered, with great battery life, and most importantly, sounds amazing! A huge shout out to KIRBY MEETS AUDIO for his help in designing the speaker enclosure and selecting the Tang Band drivers. His channel has a wealth of information on speaker design and speaker building, and his video production is top notch. Go subscribe to Kirby Meets Audio if you haven’t already! Also, a big thanks to FOCUSED SKATEBOARD WOODWORKS for sending me their offcuts and making this build possible. Check them out! For those interested in building one of these, here are the calculations for the Tang Band 5" speakers and 2.5" ports. The below shows the enclosure for a single speaker -- for the boombox, you'll have two enclosures; one for each speaker. In this video I show how to make a Modustrial-designed DIY “Living Art” LED lamp from plywood and an LED matrix. The LEDs in the lamp are controlled by an Arduino Nano that creates colorful moving patterns, aka, “living art.” However, it is also very practical for use as a desk lamp, table lamp, or bedside lamp, since an LED push button allows you to switch from the living-art mode to normal white-light modes, and a red-nightlight mode. I made three versions of this lamp – two out of bamboo plywood, and one out of walnut plywood. You could use any type of plywood you like to build the lamp. The electronics were designed to be very simple. It can be built with NO SOLDERING. I'm excited to announce that my concrete "marble" table with shou sugi ban base won the grand prize in the Instructables Furniture Contest sponsored by Woodcraft. Thanks to everyone who voted for me! And of course, if you haven't checked out the video, now is the time!